It's that time of year when everyone is thinking about the warmer days ahead & yearning to feel the warmth of the sun on our faces. I have spent the past month ordering seeds, planning a seed sewing schedule & mapping out my farm. This year I am quadrupling my growing space by renting a field on the property next to mine so I have to admit this project has been very overwhelming at times, this year there is certainly going to be a lot of learning about flower production. Do you have a cut flower garden or have you ever wanted one? There is nothing more satisfying than nurturing something from seed and watching it grow into a beautiful flower and then being able to go out into your garden and cut an armful of flowers to create your own bouquet. You really do not need much room in the garden to give you a lovely supply of flowers throughout the summer. Here are some suggestions of flowers that you might like to try in your own cut flower garden. All of these seeds are available from Floret Flowers & Johnny's Seeds. Zinnias are a great easy to grow flower and the more you cut them the more they grow back. I start 90% of all my flowers in trays inside. Zinnias are a fast growing seed and should be started 4 weeks prior to your last frost date. 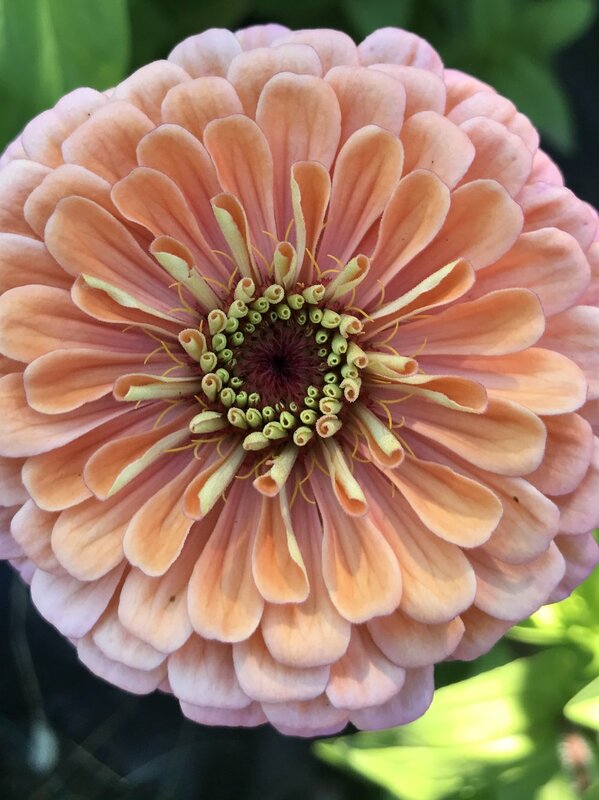 In Kitsap County, Washington that is around 19th April, zinnias do like to be cold so I would plant them into the ground a couple of weeks after our last frost date so that you can give the soil chance to warm up. Once your zinnias are about 18 inches tall you should pinch the stems off at the center, this will encourage new additional growth, yes I know it is scary pinching off that first stem but it will give you much fuller plants and longer stems. I always advise not buying seeds from big box stores, you never know the quality of the seed and how long it has been sitting around. Zinnias come in so many vibrant shades that will brighten up your kitchen table. As the months progress I will give you some tips proper harvesting techniques for your cut flower garden. Sunflowers are one of the easiest to grow flowers, how many times has your elementary school grown sunflowers with your children, they certainly are quick & easy to grow. I have moved away from growing your typical giant sunflower, I love their bright sunny faces but when they grow so big they are almost impossible to have in a cut flower bouquet. I now grow sun flowers from the pro cut series. They are single stem sun flowers which do not grow so large but they do still have the same beautiful happy faces. The Pro Cut Sunflowers are what you call "one cut wonders" so once you have cut that flower the plant is finished. Sunflowers can either be directly sown into the ground after the last frost date or started indoors 2-3 weeks prior to the last frost date. I plant sunflower seeds every 2 weeks so that I have a continues supply of sunflowers throughout the summer. Bachelor Buttons prefer to be sewn straight into the ground, once the soil is warm enough to be worked. Sow seeds thinly in rows, 6 seeds per foot, 1/4" deep, cover lightly. Once a full set of leaves has appeared thin out the plants to 6 inches apart. Bachelor Buttons do prefer to be planted in full sun. I have love hate relationship with snap dragons. I love the graceful spires in their beautiful colors. As a child I remember pulling the floret's off and pretending to talk with their little mouth's. However the seed sewing of these beautiful flowers can be a devil. The seeds are so tiny and impossible to pick up one by one by hand. Don't be tempted to just sprinkle seeds on your cell packs. The easiest way I have found to sew these impossibly small seeds is by having a wooden cocktail stick & a cup of water. Dip the end of the cocktail stick in water and then carefully tap one of the seeds with your moist cocktail stick, hopefully you will just attached one seed and then tap it into your seed cell. 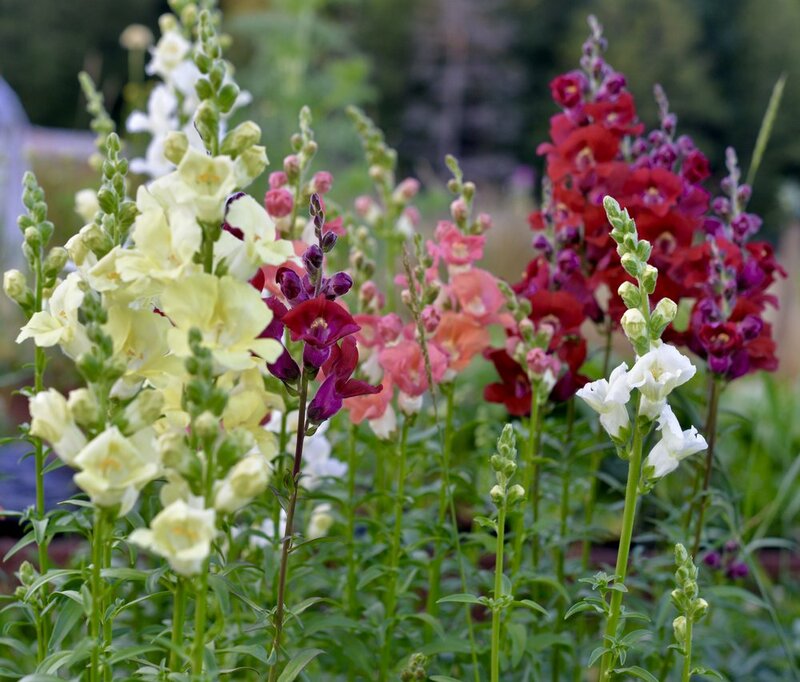 Snap dragons only need a light covering of soil. Your seed cells must be watered from the bottom so that you do not risk washing away the seeds by watering from the top. Once the seeds have germinated & are a little stronger then you can water from the top. Seeds can be started inside 8-10 weeks before the last frost date. Hopefully this will give you some ideas so that you can start thinking about planning your own cut flower garden as the weather hopefully starts to warm up in the next few weeks.